Do I need a power outlet to use this? No you do not! The Front Clamp Standing Desk Converter requires zero power to use thanks to a pneumatic gas cylinder located within the main unit. 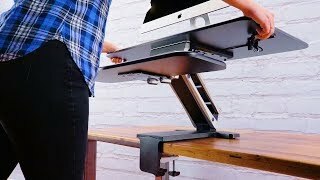 How does the Front Clamp Standing Desk Converter install to my desk? As you might have figured out by its name, this desk converter clamps! Installing the converter this way lets you lower the keyboard tray to desk level for better ergonomic positioning when sitting. How is this different from your other standing desk converters? The Front Clamp Standing Desk Converter allows you to enjoy the benefits of a adjustable height workstation, without needing to buy a new desk. This converter differs from our XF Standing Desk Converter due to its front clamp desk design, which requires you to attach it to your desk. Does this come with a mouse platform or a keyboard tray? Absolutely, this desk converter features a tiered keyboard tray/mousing platform that allows you type, mouse, and task in more comfortable postures. Why should I use a desk converter? If you want to stand throughout the day at work but are stuck with your current desk, a standing desk converter can help. Our Front Clamp Standing Desk Converter is an ideal ergonomic tool to create a standing desk, without requiring you to buy a whole new one. Simply clamp the Front Clamp Standing Desk Converter onto the front edge of your old desk for more comfort from the first use! Accessorize the Lift Standing Desk Converter with an UPLIFT View Monitor Arm. Add a single or dual UPLIFT View monitor arm to increase usable desk space at your workstation. UPLIFT View arms come ready to uplift monitors 4.4 - 19.8 pounds and up to 30". They include a clamp mount and a bolt-through mount option for installation, and come packed with two USB 3.0 ports in the base for powering and charging devices. Built-in cable organization keeps your area clean and copacetic, while changing the height, depth, and tilt of your monitor lets you work in more comfort than ever before. Tired of looking in that downward angle at your laptop display? The UPLIFT View Laptop Mount can be added to any UPLIFT View single or dual monitor arm and fits notebooks 10.1'' - 17.3''. It mounts directly to a VESA plate, converting the monitor arm to an adjustable laptop mount. This gives you the freedom to raise your laptop to more comfortable working heights. We recommend using an external keyboard and mouse when the laptop screen is elevated, to maintain ideal ergonomic postures of your arms while working. The E7 Active Anti-Fatigue Mat offers a way to stretch, exercise, and get some extra support while standing at your desk. Massage your feet on the textured mounds located on the front or back of the mat. Stretch the arches of your feet or your sore calves by moving into different positions on the mat. Get your converter in a jiff, just add our expedited production option to your order. Place your order by 3 pm Central on a business day and your order will ship the same day. If placed after this time, your converter is guaranteed to be shipped the following business day.